Abortion S. 758—Sen. Tammy Duckworth (D-IL)/Health, Education, Labor, and Pensions (3/12/19)—A bill to ensure affordable abortion coverage and care for every woman, and for other purposes. H.R. 1692—Rep. Barbara Lee (D-CA)/Energy and Commerce; Ways and Means; Oversight and Reform (3/12/19)—A bill to ensure affordable abortion coverage and care for every woman, and for other purposes…. Congress is still in recess! ICYMI catch-up on past bills introduced affecting women and their families at https://t.co/TFr9p2VWXj. Congress is in recess until April 29th. We now are accepting applications for the 2020 Congressional Fellowships on Women and Public Policy! Please visit our Fellows page for more information and links to the application materials. The application deadline is 5 p.m. Eastern, Monday, June 3, 2019. Would you like to receive updates from WCPI? 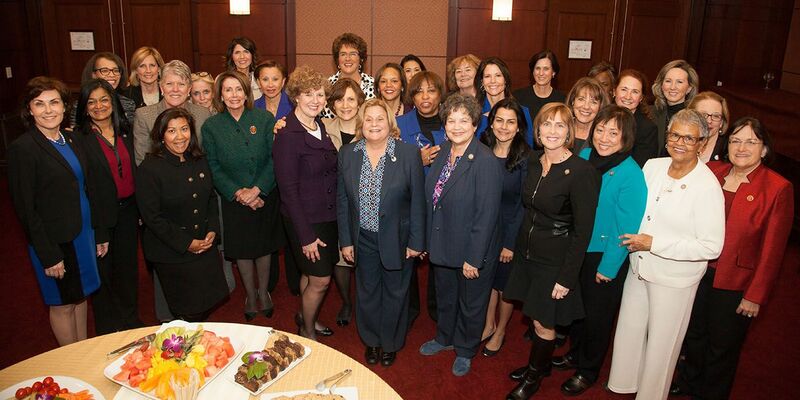 Reps. Susan W. Brooks (R-IN) and Lois Frankel (D-FL) lead the Women's Caucus in the 115th Congress.